Splendid is a brand that has focused its ethos on designing stylish looks for all the family that are as comfortable to wear as they are good looking. The brand has developed from T-shirts, expanding into footwear, nightwear, dresses and trousers, as well as a range of other lines. Splendid's beachwear is chic and relaxed with a selection of bikinis, cover ups, tankinis, bralets and swim tops as well as well as swimsuits and one pieces. 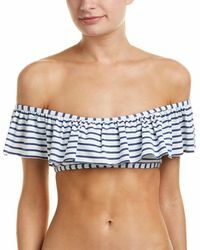 Stripes, prints, block colours and geometric designs all feature and the clever range includes design features like reversible swimwear and pretty details like ties and frills.